The fully automated DWL 66+ laser writing system is located inside an environment chamber for stable environment of the system with controlled laminar airflow and temperature stability. The chamber is situated on a granite base with air cushions for vibration isolation. The optical system includes highly reflective mirrors and acousto-optic modulators for real-time beam correction. The Laser diode is a 405 nm. Two writing modes are available: Write mode I (min feature size of 0.6 um) and Write mode III (min feature size of 1.0um). Maximum substrate size is 9"x9"
Minimum feature size is 0.6 um (writing mode I) and 1 um (writing mode III). The DWL source is a 405 nm laser. To use lithographic direct exposures, the photosensitive coating of the substrates has to be chosen according to the wavelength used and the intended application. Standard substrates for masks are chromium coated plates of float glass or quartz (depending on the requirements concerning temperature stability) with anti-reflection layer (e.g., chromium-oxide), or silica wafers. Standard coated plates can be obtained by contacting the clean room office. 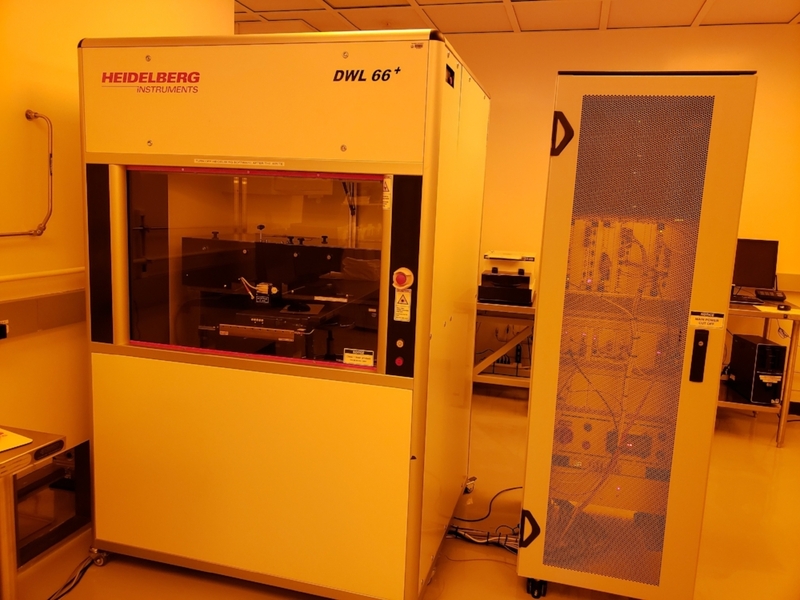 For additional information about the Heidelberg DWL 66+ Laser Writer, please contact Dr. Jen Yu at jy2488@columbia.edu or the clean room staff at cnicleanroom@columbia.edu.